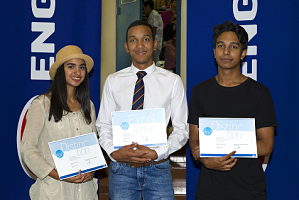 Engen’s Maths and Science Schools (EMSS) held an awards ceremony held at the Cape Peninsula University of Technology on Saturday, March 3rd to celebrate the outstanding results of their top graduates. Overall, the EMSS matric class of 2017 attained an impressive 94% pass rate, with the Cape Town classroom achieving 100% pass rates. Claremont High School matriculant Uri Engelbrecht came top in the Western Cape and was named the third best performer nationally, beating out more than 550 participants. Aged just 17, the Lotus River learner attributes his excellent 2017 matric results to the crucial extra classes provided by the Engen-backed initiative. He began his engineering and mechatronics studies at Stellenbosch University earlier this year. Taking second place was Zakiyyah Petersen, who matriculated from Claremont High School and is studying civil engineering at Stellenbosch University. Meeka-El from Athlone came top in his matric class at Livingstone High School with a 97% aggregate, and 92% for science and 82% for maths. He says he never doubted the incredible opportunity afforded by the Engen classes. There are currently nine EMSS schools across South Africa, with classes in the Western Cape, Eastern Cape, Gauteng and KwaZulu-Natal. EMSS provides a high-quality learning experience, including teaching and educational materials, for learners from Grade 10 to 12. A total of 555 EMSS learners wrote the Grade 12 National Senior Certificate Examinations at the end of last year, with 366 achieving Bachelor passes. For Cape Town specifically, 46 of 49 learners involved in the programme achieved Bachelor passes. “We are so incredibly proud of our learners, who epitomise the quality of the young people we work with around the country every year. Our ultimate reward is to help set them up to pursue stimulating careers that won’t only benefit them personally, but also the economy as a whole,” says Adhila Hamdulay, Corporate Social Investment Manager at Engen. Engen’s Hamdulay says it is extremely gratifying receive such positive feedback from the Western Cape’s star learners. “We strongly believe that we have a responsibility to help young people realise their full potential, and we feel enormously privileged to have played a role in their impressive achievements,” she says.